The first time Lindsay Markel ’08 went to meet the man we’ll call Theo, she did what her mother said was the polite thing to do in December: She brought a brightly decorated box of homemade Italian Christmas cookies. Since that day in 2008, Theo’s world has never been far from Markel’s mind. A Latino inmate in a Massachusetts prison, Theo is serving a life sentence, with no hope of parole, for a murder conviction that Markel and her colleagues at Brandeis’ Schuster Institute for Investigative Journalism question. Most working days, the Princeton, Mass., native, other institute staff members and a team of eight paid student sleuths comb public records and analyze circumstances around Theo’s alleged crime, searching for clues that justice was not served. The case — among those being investigated by the Schuster Institute’s Justice Brandeis Innocence Project — recently was taken up by the Committee for Public Counsel Services, the Massachusetts public defender organization, which filed a motion for a new trial. Markel hopes the extensive legwork done at Brandeis will help provide crucial information for those seeking to overturn Theo’s conviction. Tracing her finger along a tattoo around her wrist that spells out Martin Luther King Jr.’s famous words Injustice anywhere is a threat to justice everywhere, Markel says this is not the life she’d planned. When Markel graduated from Brandeis, she explains, she had already lined up a position for the following September teaching English in Spain. She even had a plane ticket. In the interim, she decided to apply for a summer job at the Justice Brandeis Innocence Project — one of several thematic investigations under way at the Schuster Institute, a nonprofit journalism organization housed at Brandeis and dedicated to covering social justice and human rights issues. By the summer’s end, she was so engaged in the center’s work that she readily jumped at a full-time job offer from director Florence George Graves, a crusading journalist who had worked as an investigative reporter at The Washington Post and founded Common Cause Magazine in 1980. One of the draws for Markel was the chance to continue working with Graves and associate director E.J. Graff — both “positive, brilliant, motivated female mentors,” she says. After serving three years as a research specialist, Markel was promoted last summer to a new role as the institute’s assistant director. Many people know that recent science has yielded up DNA analysis leading to the exoneration of innocent people. It’s often the stuff of TV dramas, and a real-life case was depicted to great effect in the 2010 film “Conviction,” directed by Tony Goldwyn ’82. 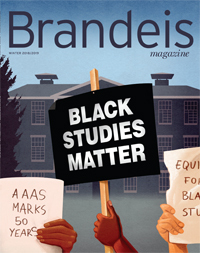 Last year, Markel collaborated with Schuster Institute Senior Fellow Michael Blanding on an eye-opening exposé on the subject for The Boston Globe Magazine. In the article, “Failing the DNA Test,” the co-authors made a case for new legislation being considered in Massachusetts, one of only two U.S. states lacking a law specifically granting inmates the right to DNA testing that might prove their innocence. But the cases Markel, Graves and their student research assistants are working on are even thornier, since they were referred to Brandeis only after the New England Innocence Project, a Boston organization of lawyers who also strive to exonerate the wrongly convicted, had determined there was no DNA evidence available to test. “The DNA exonerations are just the tip of an iceberg of likely wrongful convictions, and the worst part is that we don’t even know how big the iceberg is,” Markel says. Most cases in which inmates claim innocence don’t have physical evidence that can be subjected to DNA analysis, because it wasn’t left in the first place, wasn’t collected or was stored improperly, making it useless. Lacking the magic bullet of DNA, the Schuster Institute investigative reporters have a more elusive task: proving justice was miscarried because of lies, significant mistakes, procedural errors or insufficient investigation of alternate theories of the crime. It’s a challenging standard. The frustration involved in such a records search is barely hinted at in “Conviction,” which compresses long years of effort into a 107-minute treatment. And, unlike the film’s nonfiction heroine, attorney Betty Anne Waters, who successfully located the specific blood evidence that cleared her brother’s name, the Schuster team has to read carefully through mountains of paperwork in search of who-knows-what. Were there significant inconsistencies in statements? Were all the relevant documents properly disclosed to defense attorneys? Did the attorneys exhaust every possibility to mount appropriate defenses? What was the climate like in the communities where the crimes took place? Did the witnesses have hidden motives? “You read and read, and, as you do, you make notes of what other questions you need to ask, which people you should investigate further, whom you should interview, and what you need to know before you contact them. When you find something, however small, it really makes your day,” Markel says. And, indeed, many of the landmarks that keep the investigative journalist and her research assistants going do sound small. In one case, a witness had identified the dialect the perpetrator spoke — it was not the one spoken by the accused; how had that slipped by? Several witnesses were habitual drug offenders, and one testified that she had a 10-bag-a-day heroin habit and was high on the days before and after the crime, but not when she allegedly witnessed the murder; why was her word so easily accepted? Two documents emerged that had pointed to another potential suspect; why had they never been properly disclosed to defense attorneys? Along the road to justice, Markel has received a mini legal education and been schooled in what kinds of patterns to look for, partly by attending conferences held by the Innocence Network, which Barry Scheck — a pivotal character in “Conviction” and a key player in exoneration projects nationally — co-founded to help crusaders in this arena share knowledge and improve practices. Among the things she’s learned is that eyewitness misidentification is by far the number one contributor to wrongful conviction. What’s more, witnesses who misidentify a subject are apt to feel more and more certain of the original identification as they get subtle cues and rewards (a nod; a “good job!”) from the police and others interested in seeing the suspect convicted. Sometimes, investigators can skew lineups or photo arrays to secure an identification, right or wrong, by including only one person who meets the physical description of the perpetrator. Of the 289 prisoners who have been exonerated as the result of DNA evidence nationally, Markel says, 75 percent were mistakenly identified by eyewitnesses, and in 36 percent of those cases more than one witness had misidentified the same innocent person. Sometimes the student researchers become so transformed by their endless search for justice that they decide to pursue a career in public interest law. Mat Schutzer ’08 wrote his senior thesis on an innocence-related topic and later enrolled at New York University Law School and performed an internship at the national Innocence Project in New York. Nathan Robinson ’11 already knew he wanted to become an attorney; after working at the Justice Brandeis Innocence Project, he expressed an interest in working with clients who are indigent or have been the victims of injustice, says Markel. He’s now a first-year student at Yale Law School. Debbie Frisch ’10, another former Schuster Institute research assistant, is now a case assistant at the law firm Goodwin Procter, where the New England Innocence Project is based. This fall, Markel will follow their path, leaving behind the life of an investigative journalist and heading to law school.